Low-grade fibromyxoid sarcoma (LGFMS) is a rare soft tissue tumor typically affecting young to middle-aged adults. Despite its otherwise benign histologic appearance and indolent nature, it can have fully malignant behavior, and recurrence and metastasis may occur even decades later. We report a case of LGFMS in the left lower leg of a 5-year-old Japanese boy. A magnetic resonance imaging (MRI) uncovered a well-demarcated intra-gastrocnemial tumor measuring 27-20 mm with a slightly high intensity on T1WI and heterogeneously high intensity on T2WI. Histologically, the tumor was composed of bland spindle-shaped cells with a whorled growth pattern. The tumor stroma was variably hyalinized and fibromyxoid with arcades of curvilinear capillaries and arterioles with associated perivascular fibrosis. Although LGFMS is known to affect children under 18 years of age, it is extremely rare in infants and children under 5 years of age. Despite the young age, this patient was accurately diagnosed by the typical histology and the detection of a FUS-CREB3L2 gene fusion. Although LGFMS in children tends to be located superficially, this case presented with an intramuscular tumor in the region of the gastrocnemius. To the best of our knowledge, this is the first case of deep LGFMS arising in a child younger than 5 years of age. The patient is still alive with no evidence of the disease 4 months after diagnosis. Low-grade fibromyxoid sarcoma (LGFMS) is a rare soft tissue tumor that typically affects young to middle-aged adults ,. The median age of onset for LGFMS is 34 years , although patients of any age can be affected, and 13-19% of cases occur in patients 18 years and younger ,. However, LGFMS is rare in children during the first 5 years of life . To the best of our knowledge, the youngest case of LGFMS is a tumor arising from the cheek in a 22-month-old girl . Histologically, LGFMS is composed of bland spindle-shaped cells in a whorled growth pattern, arranged in alternating myxoid and collagenized areas along with curvilinear capillaries and characteristic arterioles with perivascular fibrosis. Although most of the tumor cells show benign histological appearance, approximately 10% of the tumor may have scattered large, hyperchromatic and pleomorphic nuclei . Furthermore, approximately 40% of cases have focal areas of hypocellular collagen cores rimmed by epithelioid fibroblasts, referred to as collagen pseudo-rosettes. Cases with prominent collagen pseudo-rosettes are referred to as hyalinizing spindle cell tumor with giant rosettes . In spite of its otherwise benign histologic appearance and indolent progression, many cases of the LGFMS may recur or metastasize decades later, mainly to the lung. Therefore, it is important to make a correct diagnosis and provide long-term follow-up for LGFMS patients. However, a diagnosis of LGFMS is often difficult because of a small biopsy specimen that can lead to a misdiagnosis of malignant tumors as benign or as tumor-like lesions including nodular fasciitis, schwannoma, desmoid-type fibromatosis, neurofibroma, and myxofibrosarcoma -. Although, LGFMS is negative for most immunohistochemical markers, a recent study identified up-regulation of the mucin 4 (MUC4) gene in LGFMS compared with histologically similar tumors and lesions ,, and MUC4 immunostaining was a sensitive and specific marker of LGFMS in the appropriate morphologic context ,. Additionally, it has been described that claudin-1, which was associated with tight junction protein, and epithelial membrane antigen (EMA) were negative for LGFMS  with exceptional positivity for LGFMS with perineuriomatous component . Perineurioma is a benign soft tissue tumor, derived from perineural cells which differ from other mesenchymal cells by virtue of their formation of tight junctions . Several recent studies demonstrated that greater than 90% of LGFMS have a balanced chromosomal translocation t (7;16) (q32-34;p11) leading to the fusion of the FUS and CREB3L2, while a minority of cases have a t(11;16) (p11;p11) translocation leading to the fusion of the FUS and CREB3L1 ,,-,,. In one report, a small number of LGFMS cases contained EWSR-CREB3L1 gene fusions . We report a case of a 5-year-old Japanese boy with deeply located LGFMS in the lateral aspect of the lower leg. The diagnosis of LGFMS was confirmed by the presence of the characteristic FUS-CREB3L2 gene fusion using reverse transcription polymerase chain reaction (RT-PCR) from a formalin-fixed, paraffin-embedded (FFPE) biopsy specimen. A 5-year-old Japanese boy was referred to our hospital with a painless mass in the lateral aspect of the left lower leg. An MRI revealed a well-demarcated intra-gastrocnemial tumor measuring 20 - 27 mm with slightly high intensity on T1WI and heterogeneously high intensity on T2WI (Figures 1A and 1B). Histopathologically, the tumor was composed of bland spindle-shaped cells with a whorled growth pattern on the biopsy specimen. The tumor stroma was variably hyalinized and fibromyxoid with arcades of curvilinear capillaries and arterioles with perivascular fibrosis (Figure 2A-2C). The tumor showed no nuclear pleomorphism, high cellularity, or necrosis, and had few mitoses. Differential diagnosis on conventional H&E staining included desmoid-type fibromatosis, schwannoma, and LGFMS. 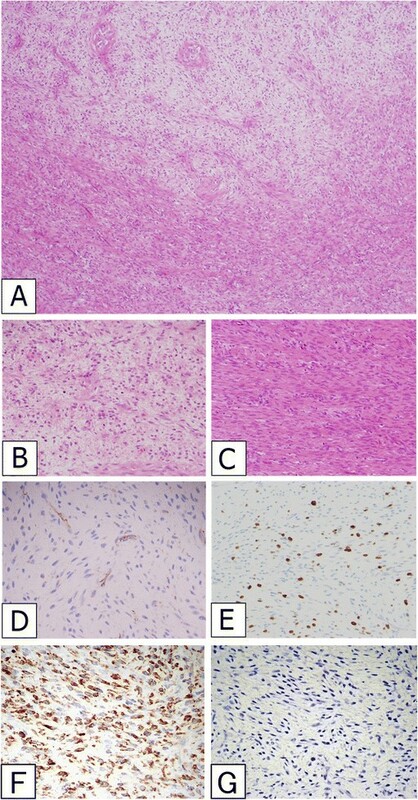 Immunohistochemically, the tumor cells were negative for S-100 protein and nuclear staining of beta-catenin, typically present in desmoid-type fibromatosis. The Ki67 proliferation index was approximately 20% (Figure 2D and 2E). Moreover, we performed immunohistochemical staining for MUC4 (sc-53945, Santa-Cruz Biotechnology, Dallas, TX, 1:100, mouse monoclonal), claudin-1 (Product# LS-B6327, LifeSpan Biosciences, Seattle, WA, 1:200, rabbit polyclonal) and EMA (E29, DAKO, Grostrup, Denmark, 1:100, mouse, monoclonal) on this case. Tumor cells showed diffuse, strong cytoplasmic immunoreactivity for MUC4. On the other hand, the tumor did not show immunoreactivity for claudin-1 and EMA in line with the absence of perineuriomatous component (Figure 2F and 2G). MRI of lower left leg of the 5-year-old patient. An axial view MRI revealed a well-defined mass measuring 27 - 20 mm in the lateral aspect of the gastrocnemius. The mass had slightly high intensity compared to the skeletal muscle on T1WI (A) and a heterogeneously high intensity on T2WI (B). Tumor Histology. An admixture of myxoid and fibrous areas was observed on H&E staining (A). Higher magnification views of myxoid (B) and fibrous (C) components of the tumor. A whorled growth pattern with bland spindle-shaped tumor cells was observed. Immunoreactivity for nuclear β-catenin was absent (D). Ki67 staining was present with a proliferative index of approximately 20% (E). Tumor cells showed diffuse and strong immunoreactivity for MUC4 (F). Tumor was negative for claudin-1 (G). To determine if the FUS-CREB3L1 and FUS-CREB3L2 fusion genes were present in the tumor, we performed RT-PCR from FFPE tumor tissue. Briefly, five 10-μm thick paraffin sections were cut from the paraffin-embedded block. RNA was isolated using the RNeasy FFPE kit (QIAGEN, Hilden, Germany). Purified RNA was reverse transcribed to cDNA using the Superscript first-strand synthesis system for RT-PCR (Invitrogen, CA, USA). The primer sequences used for the amplification in this study were described previously . The PCR product was separated on a 2% agarose gel, and a PCR product of the appropriate size was cut from the gel and sequenced. Sequencing confirmed a gene fusion between exon 6 of the FUS and exon 5 of CREB3L2 (Figure 3). Despite the young age of the patient, a diagnosis of LGFMS was confirmed, and the patient subsequently underwent wide resection at the affected area. Macroscopically, the resected surface of the surgical specimen was gray with a glistening appearance (Figure 4). Pathological analysis of the resected tumor confirmed the LGFMS histology observed in the biopsy specimen. Four months after diagnosis, the patient is alive with no evidence of the disease. Detection of a FUS-CREB3L2 fusion in the LGFMS tumor. RT-PCR on FFPE-derived RNA was performed. DNA sequencing revealed a fusion between FUS exon 6 and CREB3L2 exon 5. Gross morphology of LGFMS from the 5-year-old patient. The resected surface of intramuscular tumor is tan to gray colored and has a glistening appearance. The tumor is located in the subcutis and skeletal muscle throughout the fascia. The importance of molecular pathological diagnosis is increasing in the clinical pathology, especially in the field of soft tissue sarcomas, because the definite diagnosis made by the molecular pathology such as RT-PCR and specific genetic testing sometimes leads to the application of the tumor specific therapy  - . Recently, LGFMS was shown to be associated with gene fusions involving CREB3-family genes that encode members of the basic leucine zipper family of transcription factors . The majority of LGFMS cases (95%) have a fusion of the FUS-CREB3L2, and a minority of cases (5%) have a FUS-CREB3L1 gene fusion. In addition, a small number of cases have EWSR-CREB3L1 gene fusions . Because of its typical histology and the presence of a FUS-CREB3L2 fusion, we were able to correctly diagnose LGFMS, despite the atypical age of the patient. LGFMS can affect patients of all ages, and 13-19% of the cases occur in patients younger than 18 years of age ,. Nonetheless, desmoid-type fibromatosis would be the most important differential diagnosis in this deeply located tumor. Desmoid-type fibromatosis is a locally aggressive infiltrative intra-muscular tumor, in spite of benign histologic feature. Frequent recurrences can be clinically observed even after wide resection. A "wait-and-see" strategy is, at the present time, preferred in case of asymptomatic or non-progressive disease, especially for the patients of young age. Medical treatment such as cyclooxygenase-2 selective inhibitor is another choice for the patients with desmoid-type fibromatosis . LGFMS is extremely rare in children younger than 5 years of age , and we found only 34 LGFMS cases in children under 15 years of age reported in English literatures. The clinical, histological, and genetic information of the previously reported cases are summarized in Table 1,, - ,,, - . Nine cases up to 5 years of age were found including the present case. In our review of LGFMS in infants and young adolescents, the male to female ratio was 7:2 in infants (0-5 years of age) and 8:5 in young adolescents (6-15 years of age). In adult cases, the male to female ratio was reported to be either equal  or 3:1 . The greatest mean tumor diameter was 3.7 cm in both infants and young adolescents, and this was smaller than that found in adult cases (mean 7.7 cm) . LGFMS tends to be located superficially in young patients, whereas deep LGFMS accounts for the majority of adult cases ,. Superficial LGFMS was reported to account for no more than 10% of LGFMS cases in all ages ; however, it was found in 73% of the patients 15 years and younger in our literature review, in line with the previous finding . Particularly, in patients 5 years of age or younger in which information for the depth of the tumor was available, all cases were located superficially, and our case was the only one that was deeply located. Empty spaces: Data not available. Considering both the smaller size and superficial location of LGFMS arising in correspondingly smaller infants and young adolescents, LGFMS in children might be noticed before becoming larger and invading into the fascia and skeletal muscles. Metastasis/local recurrence rates were 13%/38% in infants and 24%/41% in young adolescents, respectively, in our literature review. These rates are not significantly different from those previously reported in adult LGFMS . In addition, no differences in gene fusion events were noted between infants and young adolescents with LGFMS. Finally, we report a rare case of a 5-year-old Japanese boy with deeply located LGFMS in the lateral aspect of the lower leg. The superficial location of LGFMS in pediatric patients might be a reason for the relatively small tumor size in juvenile populations. Furthermore, superficial tumors are easily palpable and readily recognized by the patients and their parents. Wide resection of the tumor in the limb reduces the recurrence rate, but also affecting the future functional outcome, especially in the childhood. Recent advance in molecular pathology is helpful to distinguish specific soft tissue tumors from their histologic mimics. It is important to avoid misdiagnosis and provide appropriate treatment with a help of molecular diagnosis. Written informed consent was obtained from the parents of the patient for the publication of this report and accompanying images. The copy of the written consent is available for review by the Editor-in-Chief of this Journal. This work was supported in part by a Grant-in-Aid for General Scientific Research from the Ministry of Education, Science, Sports and Culture (#26670286 to Tsuyoshi Saito, and #25861342 to Yoshiyuki Suehara), Tokyo, Japan. YS, TT and KK performed surgical treatment for this patient. AKA, MT, TS carried out the molecular genetic studies, participated in the sequence alignment. KM performed immunohistochemical analysis. AKA, AA, TY and TS drafted the manuscript. All authors read and approved the final manuscript.